TOLUCA, MEXICO, 20 May 2012 – Despite it being a Sunday, the President of University of Ixtlahuaca CUI, Prof D Ballesteros Margarito Ortega and his senior officials and post-graduate students warmly received a UKM delegation to its campus here today. The delegation was greeted on arrival by the traditional Cuicoyán Group and later signed a Letter of Intent for further cooperation on student and staff mobility, research and the sharing of best practices between them. It comprises Vice Chancellor, Prof Tan Sri Dato’ Wira Dr Sharifah Hapsah Syed Hasan Shahabudin; Director of the Office of International Relations UKM, Prof Dr Imran Ho Abdullah; Director of the Institute of Occidental Studies (IKON), Assoc Prof Dr Rashila Ramli together with the Cultural Attaché of Mexico in Malaysia, Dr Blanca Barragan Moctexuma, and the Coordinator of the Office of International Relations at the Intercultural University of the State of Mexico, Ms. Guadalupe Dominguez Market. Prof Ortega emphasized the importance of academic links between Malaysia and Mexico in his welcoming address and said that they were honoured by the visit. The group was taken on a tour of the facilities followed by a session with postgraduate students and staff of the university. Prof Sharifah Hapsah in response to a question on the transformation of a university said it was important that a university have a good quality assurance system and the building of a strong culture of research. 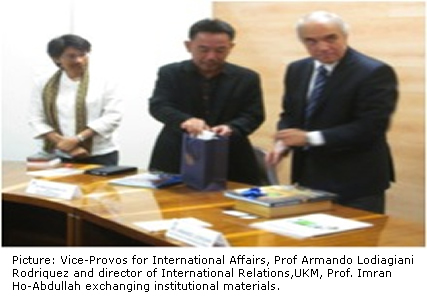 Earlier on 16 May, Prof Imran Ho and Assoc Prof Dr Rashila paid a courtesy call on the Vice-Provost for International Affairs of Universidad Nacional Autonoma de Mexico (UNAM), Prof Armando Lodiagiani Rodriquez. Prof Rodriquez in his remarks said UNAM welcomes further and stronger ties with universities in South East Asia to establish a number of general mobility and academic exchange agreements. During the discussions Prof. Rodriquez expressed interest for a formal MoU to be concluded between UKM and UNAM to afford opportunities for their students to spend time at each other’s campuses undertaking research activities and interacting with faculty members. Present at the meeting was the Director of the Office of Academic Cooperation, Angelica Castillo Salazar and the Cultural Attache of the Mexican Embassy in Kuala Lumpur, Dr Blanca Barragan Moctexuma.